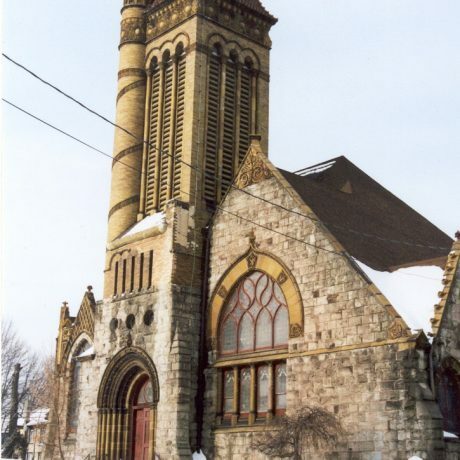 Seventh Day Baptist, built from 1890 to 1894, is a magnificent Richardsonian Romanesque structure with Gothic Revival elements. Built of terra cotta and masonry, its pyramidal-roofed bell tower is a prominent local landmark. The church’s principal benefactor was George Babcock, co founder of the boiler manufacturer Babcock and Wilcox. A Babcock-and-Wilcox-owned tile plant in upstate New York supplied the terra cotta, which may explain why there is so much of it in and on the building. Both the church’s interior and exterior feature special design elements. Remarkable terra cotta decorations grace the outside walls, while the sanctuary is dominated by a round domed ceiling with elaborate Gothic tracery. The oak paneled walls incorporate terra cotta tiles. Seventh Day Baptists are evangelical Baptists who believe in keeping the Sabbath as a sacred day, which they observe from sundown Friday to sunset Saturday. The sect has its roots in New Jersey in the seventeenth century. But because membership in Plainfield is dwindling, the members have not been able to keep up with the costs of maintaining this extraordinary house of worship. Deferred maintenance has led to deterioration that will continue unless the congregation can find the funds to preserve this unique building. Congregation yet looking for resources to raise funds to maintain and stabilize the property.